Variable "pcapName" can be modified as needed to represent a friendly name. Either "host1" or "host2" can represent the client or server. On trigger execution, only the server port will be used for matching, whereas the client port is ignored (most likely ephemeral). Once these items are configured, simply uncheck the "Disable Trigger" checkbox and click "Save". Monitor the results either using the debug tab on the trigger, or poll the list of packet captures available in the administration user interface. Once packet captures are listed, disable trigger by re-enabling "Disable Trigger" checkbox and "Save" once again. Precision Packet Capture kit installed and licensed. 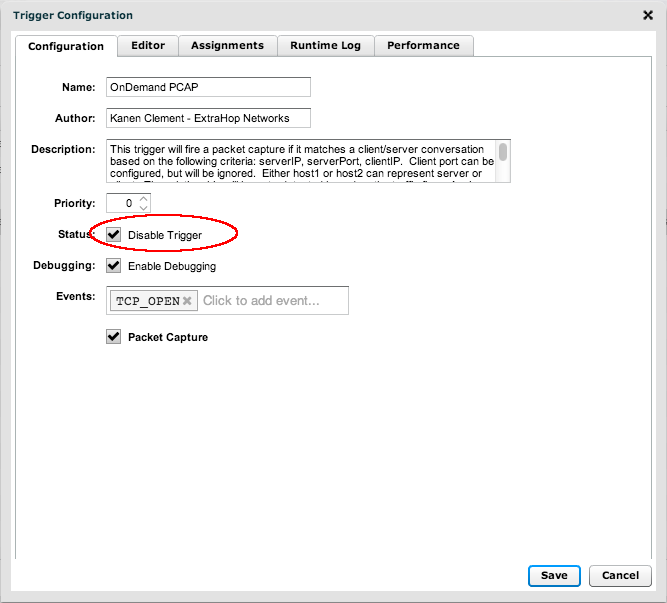 Apply the resulting ExtraHop OnDemand PCAP Bundle in the bundle detail page. Trigger is automatically assigned to all, in a disabled state. Toggle the Disable button to enable/disable PCAPs.